IC engine is made of many moving parts. Due to continuous movement of two metallic surfaces over each other, there is wearing moving parts, generation of heat and loss of power in the engine. Hence, lubrication of moving parts is essential to prevent all these harmful effects. -power absorbed due to the relative motion of different bearing surfaces such as piston rings, main bearings, cam shaft bearings etc. -In four stroke supercharged engine, compressor used to provide high pressure air which is mechanically driven by the engine. This is counted as negative frictional loss. -Some power is used to drive auxiliaries such as water pump, lubricating oil pump, fuel pump, cooling fan, generator etc. The primary purpose of the lubrication is to reduce friction and wear between two rubbing surfaces. Two rubbing surfaces always produce friction. The continuous friction produce heat which causes wearing of parts and loss of power. In order to avoid friction, the contact of two sliding surfaces must be reduced as far as possible. This can be done by proper lubrication only. Lubrication forms an oil film between two moving surfaces. Lubrication also reduces noise produced by the movement of two metal surfaces over each other. The heat, generated by piston, cylinder, and bearings is removed by lubrication to a great extent. 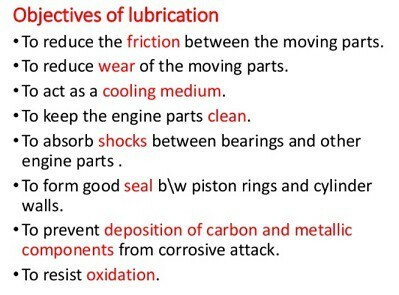 Lubrication creates cooling effect on the engine parts. The lubricant enters into the gap between the cylinder liner, piston and piston rings. Thus, it prevents leakage of gases from the engine cylinder. Lubrication keeps the engine clean by removing dirt or carbon from inside of the engine along with the oil. It should have a high viscosity index. It should have flash and fire points higher than the operating temperature of the machine. It should have high oiliness. The cloud and pour points of a good lubricant should always be lower than the operating temperature of the machine. The volatility of the lubricating oil should be low. It should deposit least amount of carbon during use. It should have higher aniline point. It should possess a higher resistance towards oxidation and corrosion. It should have good detergent quality. According to this theory, the lubricant is, supposed to act like mass of globules, rolling in between two surfaces. It produces a rolling effect, which reduces friction. According to this theory, the lubricant is soaked in rubbing surfaces and forms oily surface over it. Thus the sliding surfaces are kept apart from each other, thereby reducing friction.